It's a solid dose of adrenaline associated with overcoming their own barriers. Continuous challenges, overcoming inner fears and concerns, allow participants to learn their capabilities to the extreme. Competition altitude is also building an efficient team, working in an atmosphere of trust and openness. Typically, the fate of individuals depend on the involvement of other participants. Most organized by us tasks requires cooperation of the whole group. 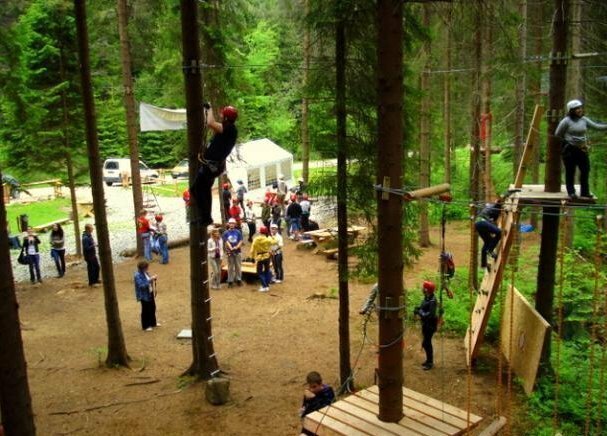 Our experienced staff, based on the techniques of rope, no problem will organize a rope bridge, construction of the tower, you roll or climb the climbing wall. Each of our competition organized by the altitude, is run by climbers Polish Mountaineering Association and Rescue lifeguards. Used by us mountaineering equipment has all approvals and safety certifications. We always provide the right amount of helmets and harnesses for our participants. 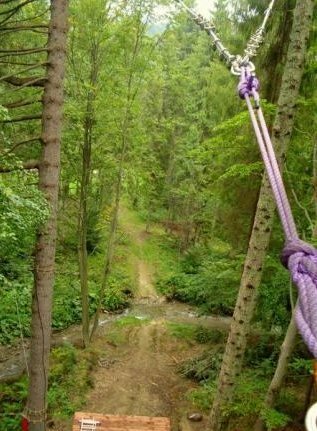 Go without touching the ground, the rope bridge built in a special way stretched between two trees or rocks. Active wobbles and shakes a few meters above the ground. Some rope bridge stretched by other group members. The more stretch, the easier it goes to individual daredevils. Between two points on the amount of 5 - 15 m rope is pulled, after which the drag while lying on the lines or on the "Koala Bear". The whole structure is very unstable therefore requires participants to extremely good sense of balance. It's a tense reunion after oblique lines suspended between two trees or between a rock and a tree. The participant is caught by a group or alone gets at the height of about 15 meters. After plugging the instructor to truck downhill, daredevil rides in on ropes down (mountaineering harness and helmet). At the bottom (with an instructor) inhibits just above the ground. Adrenaline guaranteed. It recently a very popular sport, raising the adrenaline level. People can climb almost any age. A special harness, helmet and assurance of an experienced instructor enough to deal with their own weaknesses. We choose the road climbing skills the participants. We organize climbing on rocks and artificial climbing wall. 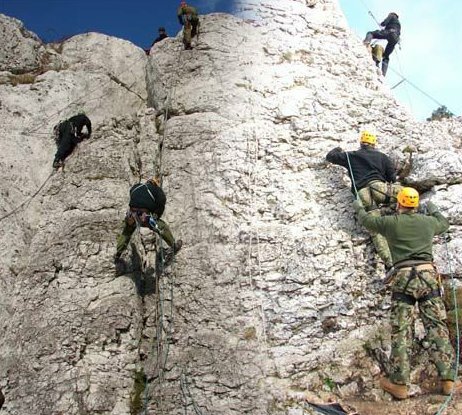 The task of each participant to rappel from a great height (exit from the rock, from the bridge, etc.). Daredevil is plugged into the line downhill. He then has to go over the edge and go down, respectively, by operating the instrument downhill. Of course, everything is done with assistance, under the watchful eye of an instructor.